Notice that there are an equal number of cells that "intrude" on either side of an orange line. In this case there are three pairs. The three green cells must have the same three numbers as the three blue cells. If a candidate appears in one group, but not the other, it can be eliminated. On row six, in the upwardly "intruding" cells (c1, c2, c5), there is the possibility of 5 (given), and 1, 3, & 4. On row seven, in the downwardly "intruding" cells (c4, c8, c9), there is the possibility of 5 & 3 (givens) and 4 & 6. Only the union of these two sets can be allowed in all six cells. This leaves 3, 4, & 5 as the only possible candidates for r6c1, r6c2, & r6c5, AND 3, 4, & 5 as the only possible candidates for r7c4, r7c8, & r7c9. 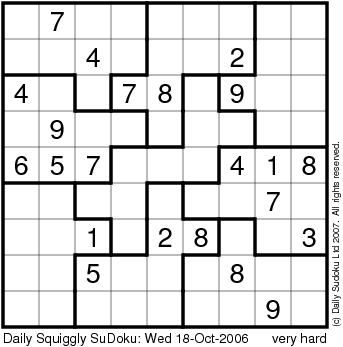 Which allows the puzzle to be completed with more basic techniques. This will also work with Squiggly puzzles with only one or two "intrusion pairs" "over the line", as long as they occur in pairs. That is one up, one down, or two up, two down, etc... Also ought to work with four pairs or more, but the technique may not eliminate enough to be useful. This can also work if the "intrusion" is two rows or columns deep. I don't know if this is a standard technique for Squiggly solving. I haven't seen anything like this, but I didn't search very hard. If it already has a name, what is it called? If it isn't named yet, I would call it "Squiggly intrusion elimination" or SIE. P.S. I'm not sure if the images will appear properly, as I don't have a "real" place to post images. Hopefully viewers will be able to follow along by using the row and column positions. Edit: I am now hosting the images on imageshack, so they ought to be visible now. a poster named Steve R explains the underlying logic. Basically, when symmetrical "intrusions" occur, certain candidates are forced to be in and out of certain places. Isn't this the Left-Over Law (LOL)? This was discussed some months ago (in response to my questions) but the threads disappeared due to the server crash. Personally, I don't like the name Left-Over Law - I think "Subset Rule" would be better. Anyhow, I'm going to post a new thread on this topic in response to today's puzzle (21 June 2007).